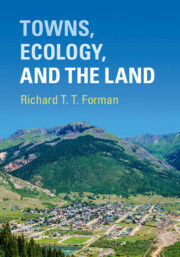 Towns, Ecology, and the Land Forman Richard T. T.
Author: Forman Richard T. T.
Add to cart the livre of Forman Richard T. T.
Part I. Town Patterns, Processes, Change: 1. Town, village, and land spatial patterns; 2. Flows and movements; 3. Change; 4. Human dimensions; Part II. Ecological Dimensions of Towns: 5. Soil, chemicals, air; 6. Water systems and waterbodies; 7. Plants, habitats, greenspaces; 8. Diverse animals and town pattern; Part III. Town and Land Interactions: 9. Commercial, industrial, and residential areas; 10. Cropland, pastureland, and towns; 11. Forestland, aridland, and towns; 12. Tying transportation, towns, and land together; Part IV. Town Ecology Principles and Solutions: 13. Toward better towns, better land.